Few names are more synonymous with civil rights than Martin Luther King Jr, but his reputation is far from squeaky clean. After one of King’s papers was donated to Stanford University, the staff found a lot of resemblances to a paper written by Jack Boozer, another student at Boston University, where MLK got his PhD in systematic theology. An investigation by Boston U confirmed this, along with discovering more resemblances between King’s works and other authors who wrote about the same topics. Even though King’s doctorate degree wasn’t revoked because of “intelligent contribution to scholarship”, there is now a letter attached to King’s paper at the university library noting the lack of proper attribution. Even King’s famous “I Have A Dream” speech was found to have borrowed a some parts from Archibald Carey Jr.’s 1952 address to the Republican National Convention. “The farther King went in his academic career, the more deeply ingrained the patterns of borrowing language without clear attribution became. 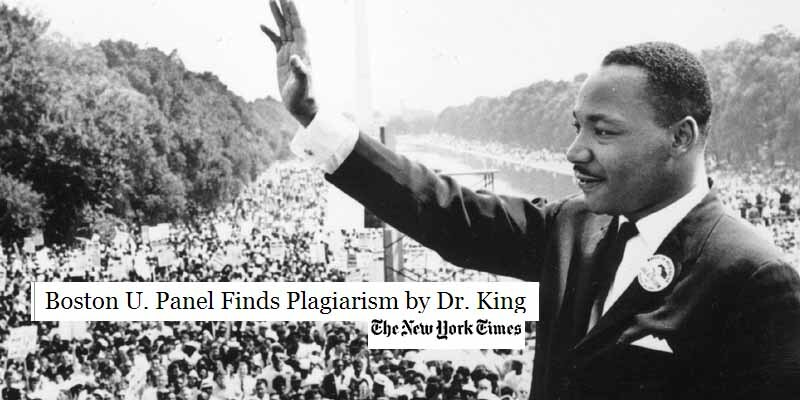 Thus, the plagiarism in his dissertation seemed to be, by then, the product of his long-established practice,” wrote civil rights historian Ralph Lurker.